Schiff base ligand derived from benzaldehyde and ethylenediimine and its Fe(III),Cu(II) and Zn(II) complexes were synthesized. The ligand N,N’-Bis(2-hydroxyl-1,2-diphenylethanone)ethylenediamine(B2HDE)and its complexes were characterized by molar conductivity, melting point, solubility test and spectrometrically (IR and UV-Vis). The Kinetics of complex formation obtained from a plot lnkobs verses 1/T, thermodynamic parameters were obtained from plots of ln(kobs/T) verses 1/T and antimicrobial activities of the ligand and its complexes were tested. 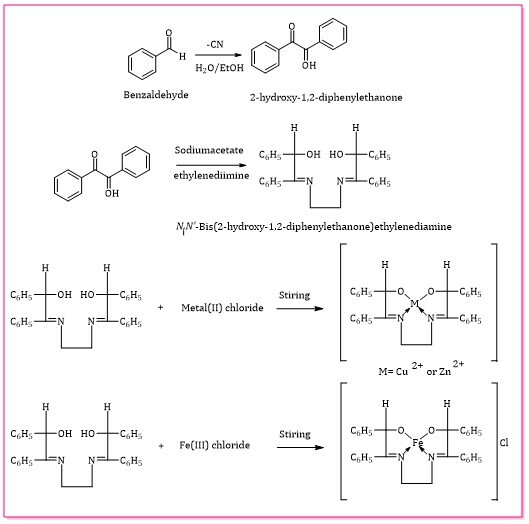 The solubility results showed that B2HDE and its complexes were soluble in dimethylsulphoxide, dimethylformanide and acetone while the melting point of ligand and complexes showed they are fairly stable. The complexes molar conductivity indicated that they are non-electrolytes. The IR spectra showed a bidented ligand which coordinated through azomethine nitrogen and hydroxyl oxygen atom. UV-Vis results confirmed the complexation of the metal and ligand with a tetrahedral geometry for both complexes and the activation energy (Ea) obtained were positive Ea indicating that, the rate of formation increased with increasing temperature. The kinetic results showed that increase in time and temperature increased the yield of the complexes. The results of thermodynamics parameters showed the formation of an activated complex via an associative pathway. Antimicrobial studies results of complexes were higher than the one found for the free ligand. Taon T.Y., Kwong C.L., Sadler J., Tsoi R., Edema M.O, Umobi C.I. New System chemistry for secondary school; Marshacl cavendis int. Singapore, 2011; p 172-179. Ochia G.N., Amasiatu G.I., Ajagbe J.O. 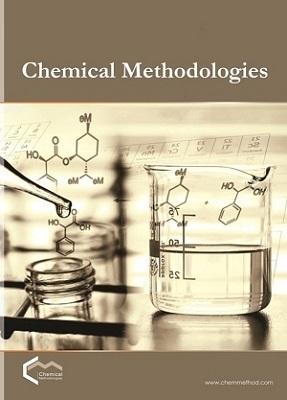 Comprehensive certificate chemistry; University press, 2013; p 218-219. Geoffrey A.L. Introduction to coordination chemistry; Willy & Ltd. 2010, p 125-170.